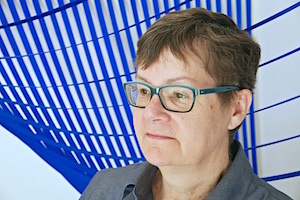 Reckewell’s work is mostly site-specific staged within an architectural environment with straight walls, 90-degree angles and artificial light. She usually creates an exact studio mock-up and/or makes detailed sketches and finished drawings before the piece is installed. At Paradise Ridge, there are gorgeous old oaks, native plants and rocks, changing light and weather and not a single straight wall in sight. This is her first outdoor piece and her process had to adjust to be more organic and less predetermined. The sculpture evolved as a response to the landscape. Before she even started to think about a particular sculptural idea, she had a conversation with the space. 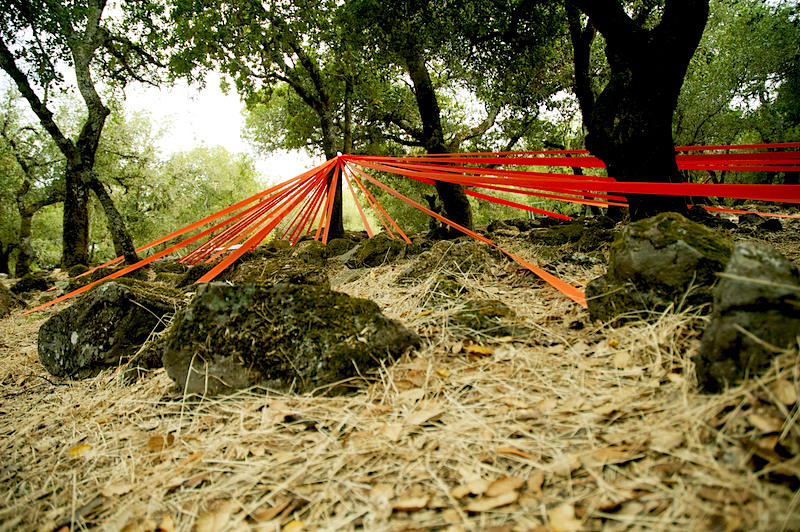 At Paradise Ridge, she selected a cluster of trees, vegetation and rocks that can be seen from gravel paths surrounding her chosen site where a viewer might see the sculpture from many different points of view. Ordinarily, her process involves creating the design by utilizing geometry: squares, triangles, circles, and curves. Next she maps it out on walls with even repetitive spacing and lines stretched across to corresponding points, but her usual process had to be modified for this situation. Instead of starting with the design, she found the right material first. The bright orange 2” wide webbing made of polyester is clearly man-made, industrial and artificial – a complete contrast to the sculpture grove which is left in a largely natural condition. She combined the man-made material with natural materials using the abundant rocks to anchor the webbing. The linear material is suspended into the trees, over branches, around trunks, thereby creating repetitious patterns in conversation with the landscape. This creates a dialogue that is not so much nature versus culture, but nature and culture interacting and co-existing. Question: Can works of art enhance the experience of being in a natural landscape? Sabine Reckewell was born in the small town of Goslar in Germany in 1950. She studied textile design first in Kassel, Germany and then at the University of California, Davis, where she received a BS in textile design. In 1978 Reckewell graduated with an MFA in textile art from Fiberworks in Berkeley and Lone Mountain College in San Francisco. Also in 1978 she married the artist Stephen Whisler. Together they moved to Claremont, CA where Stephen went through an MFA program at Claremont Graduate School. In 1982 they moved to New York City where they lived and worked for the next 26 years. Her career as an artist stalled. In 2008 Stephen and Sabine moved back to California taking up residence in Napa. They both show with Chandra Cerrito Contemporary in Oakland. She has exhibited in art spaces and with art organizations around the Bay Area.